ASCBU introduces SPIN bicycle share program. With a simple snap of a barcode, students can be on a quick spin on one of the 50 new, bright orange SPIN bikes scattered around campus. Students can begin riding after downloading the SPIN Bikes app from the app store, signing up with their Lancermail account and putting their credit card in the app. For 50 cents, a student gets the bike for 30 minutes. Students are able to park the bikes at any bike rack, lock it and be on their way to class, to grab food, Chapel or any other activity on campus. “Station-less bikeshare — an affordable GPS-enabled bike that you can lock and leave anywhere — is the perfect solution, and encourages people to drive less and get outside more,” said Matt Sink, head of campus operations for the SPIN organization. SPIN was founded in San Francisco in 2016 after the founders experienced the hassle of getting around the city when driving a car did not make sense but walking would take too long. With the worry of bike theft and maintenance, SPIN did not want to discourage economical and eco-friendly options from being utilized. The whole process to bring the bikes on campus started in August 2017 when Kendall Morris, senior communications studies major and ASCBU president, received an email from a different bike share company wanting to bring their program onto campus. Morris then found SPIN and liked how there would be no cost to bring the bikes to campus and no maintenance costs to CBU, rather SPIN would cover the cost of everything. With CBU being a primarily walking campus, ASCBU said it felt it would be best to offer an alternative for students to walking on campus. “As CBU continues to expand it will be good, since it does take about 15 minutes to walk from the Engineering Building to the Health Science Campus,” said Josh Daily, senior international studies major. SPIN originally wanted to bring 150 bikes onto campus but ASCBU decided on having 50 out for students and 25 in storage to bring out in case bikes break are in need of maintenance in the future. 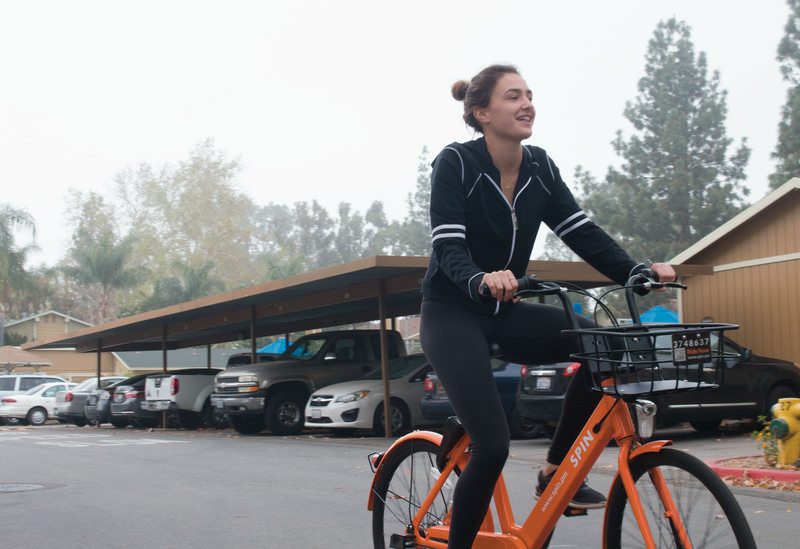 ASCBU might end up spending money on the bike-share program in the future by providing more bike racks for students to park the bikes, more SPIN bikes or by purchasing promo codes for students to have free rides during specific events on campus. SPIN bikes are on campuses all across the nation including Duke, University of Arkansas, Utah State University and 26 others as well as 18 cities such as Los Angeles.